When you inject new software into an environment, it’s difficult to forecast what will transpire. Product teams continually try to predict what will work. We predict that a certain new feature will increase conversion, that a targeted ad spend will bring critical mass, or that market conditions will change in our favor. We expect many of our bets to fail. We inoculate ourselves from bad predictions with methodologies like Agile and Lean Startup. Measuring market signal with each iteration helps us quickly change course. If the brilliant new feature decreases conversion, we can remove it before our revenue plummets. Minimizing losses from bad bets give us more opportunities to try things. However, the experience of failed attempts does not reliably lead to better predictions in the future. Faced with new information, we can overreact, under-react, misunderstand, forget, or turn a blind eye. Emotions and cognitive biases can cloud our judgment. Learning can go even more haywire at an organizational level. Add group-think, knowledge silos, and corporate amnesia to the list of epistemological threats. But imagine if we could systematically improve the accuracy of our company’s predictions. Then we could reliably increase our ability to make winning bets over time. I was surprised to discover that a playbook for optimizing prediction accuracy already exists. It’s called Superforecasting. But it’s not being widely leveraged by product teams yet. To explain Brier scores, let’s consider weather forecasting. Weather forecasting involves making probabilistic predictions like “There’s a 70% chance it will rain tomorrow.” If it doesn’t rain tomorrow, it doesn’t mean the forecast was wrong since it gave a 30% chance of no rain. This can be counter-intuitive since people have a false tendency to think that a forecast is wrong when a prediction that something is likely doesn’t end up happening. In the terminology of the Brier score, a forecaster’s predictions are “well calibrated” if the things they say are X% likely to happen actually happen X% of the time. So if a meteorologist says “there’s 70% chance of rain tomorrow” one hundred times during the year, they would be perfectly calibrated if it rained 70 times and didn’t rain the other 30. If it had only rained 50 times, we would say the forecaster is over-confident. If it had rained 80 times, they’re under-confident. Over-confidence and under-confidence are the two forms of mis-calibration. The other dimension of the Brier score is resolution. 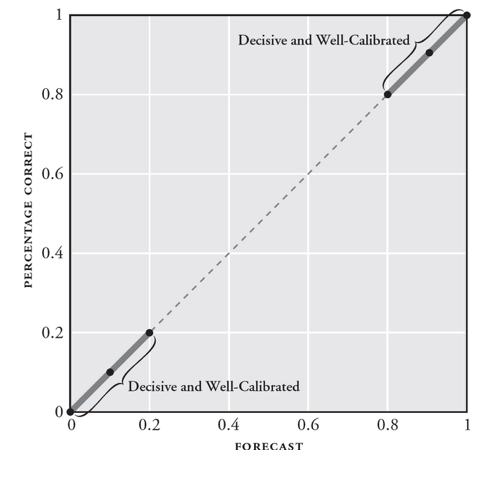 Resolution measures the decisiveness of a forecaster’s predictions. If a meteorologist says the chance of rain is 100% when it does rain and 0% when it doesn’t, they would have perfect resolution. Forecasters can be perfectly calibrated with poor resolution. Let’s say a forecaster predicts a 50% chance of rain every day. Even if it does rain exactly half of the days, their resolution will be dinged for not elevating the chances on the days it does rain and lowering them on the days when it doesn’t. Poor resolution implies overly cautious predictions. The Brier score combines calibration and resolution into a single accuracy metric. The lower the Brier score, the more accurate a forecaster’s predictions. With a metric for prediction accuracy, we can scientifically investigate which factors lead individuals or teams to improve their foresight. Tetlock did exactly this to win a forecasting tournament administered by the United States Intelligence Community. … dramatically enhance the accuracy, precision, and timeliness of intelligence forecasts for a broad range of event types, through the development of advanced techniques that elicit, weight, and combine the judgments of many intelligence analysts. As measured by the Brier score, the predictions made by Tetlock’s group of “superforecasters” were 30% more accurate than the average for intelligence community analysts who has access to classified information. I love how Tetlock’s research puts data to philosophically rich concepts, like the hedgehog-fox dichotomy. The Ancient Greek poet Archilochus famously said that “a fox knows many things, but a hedgehog one important thing.” Tetlock categorized his forecasters into each persona. The [fox] group consisted of more pragmatic experts who drew on many analytical tools, with the choice of tool hinging on the particular problem they faced. These experts gathered as much information from as many sources as they could. When thinking, they often shifted mental gears, sprinkling their speech with transition markers such as “however,” “but,” “although,” and “on the other hand.” They talked about possibilities and probabilities, not certainties. And while no one likes to say “I was wrong,” these experts more readily admitted it and changed their minds. The hedgehog vs. fox battle has been officially settled: foxes win, at least as far as forecasting goes. Tetlock found that “Foxes beat hedgehogs on both calibration and resolution. Foxes had real foresight. Hedgehogs didn’t.” Imagine an economist who relentlessly preaches austerity in the face of clear evidence showing the failure of austerity measures. The psychological recipe for the ideal superforecaster may prove to be quite different from that for the ideal superquestioner, as superb question generation often seems to accompany a hedgehog-like incisiveness and confidence that one has a Big Idea grasp of the deep drivers of an event. That’s quite a different mindset from the foxy eclecticism and sensitivity to uncertainty that characterizes superb forecasting. This is a compelling hypothesis for how foxes and hedgehogs can collaborate to achieve great things. Now that we’ve taken a quick tour of superforecasting, let’s consider how the system could be applied to product development. Everyone on your team provides probabilistic forecasts ranging from 10% to 80%. The average prediction gives a 30% chance that the new page will increase conversion by 10%. If you had seen these forecasts before you committed to doing the project, would you have moved forward with it? It depends. Given the scale of your company, maybe a 30% chance to increase revenue by 10% is a good bet to make. But maybe other endeavors are more likely to succeed, so you start forecasting all proposed projects before you prioritize them. With accurate forecasts to questions like these, we’ll be more aware of our capabilities and steps ahead of the market. We’d have the foresight necessary for exceptional strategy. 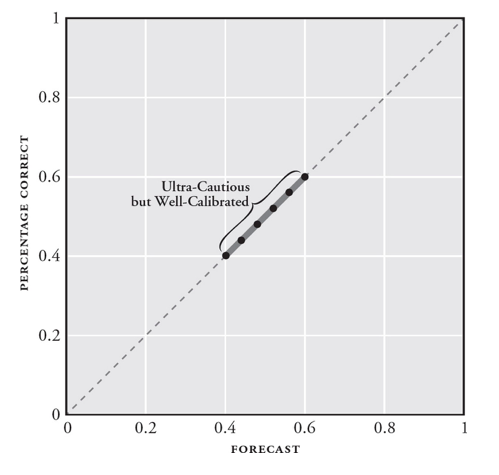 In cost-benefit analysis, you might forecast the impact of a project to be high. But what exactly does “high” mean? And in what time frame must the benefit occur? There are too many shades of gray. And maybe we’re two months after launch with little impact from the project. Does that mean the prediction is wrong or do we give it more time? With a financial model, the projections will surely not be exactly right. So how can we determine if the model was correct? How close do the numbers need to be? Cost-benefit analysis and financial models serve a real purpose, but they must be converted into unambiguous forecasts if we’re serious about improving our predictions over time. So let’s say our company starts making a high quantity of unambiguous predictions. If we calculated our collective Brier score, we’d probably see that it leaves much to be desired. Besides the fact that accurate forecasting is hard, I suspect many startup people are especially poor forecasters. There’s a hedgehoggy aspect of working on a product. It requires an almost irrational devotion to the product direction; a narrow lens that misses relevant opposing perspectives. We may be prone to overconfidence in predicting the success of product launches or improvement of their environmental conditions. Exuberant optimism is conducive to good work but runs counter to accurate forecasting. Perhaps company staff is too biased to proficiently forecast their own future. The solution could be to insert 3rd party superforecasters into a company’s operations. It appears that Tetlock co-founded a commercial firm based on this idea. I’m compelled to try this out. In the future, asking questions of superforecasters could become ubiquitous, like running user tests or customer surveys. I anticipate there’d be some challenges in transferring domain knowledge, at least as far as some key questions are concerned. But this can be overcome. Turning these practices into habits is the goal of my side-project, Double-Loop. The net effect of this personality profile is that the foxhog can live in a highly uncertain environment, and be responsively engaged within it, yet create a high-certainty execution context. Accurate predictions are not a sufficient for success. You need to ask the right questions. This requires leaving no stone unturned while you push forward on a singular mission to achieve your product vision. 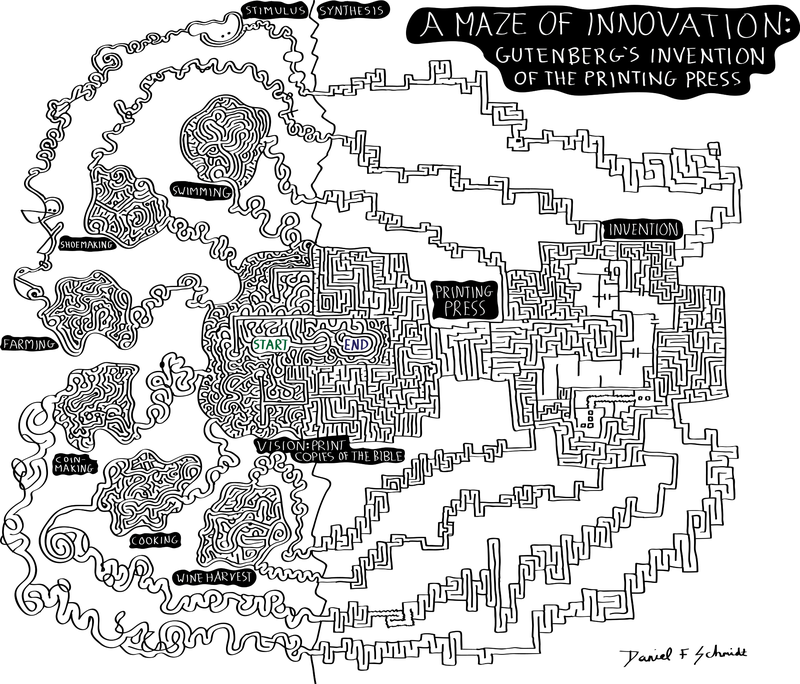 I’m developing a new medium: mazes as a story telling device for creative breakthroughs. This video explains. Some of the most interesting inventions spark new ways for people and machines to interact. One of the best examples I’ve seen of this, lately, is the iOS game Really Bad Chess. Conventional chess programs come with adjustable difficulty meters controlling the prowess of your computer opponent. At some difficulty levels, you can easily win. But when you ramp up the computer’s smartness to a certain level, you’re consistently defeated. For a game to be pleasurable, there needs to be the right amount of tension. When facing a computer opponent, you can play a competitive game by setting its ability to a level similar to your own. But this feels like fake tension, like playing against someone you know isn’t trying hard. A win doesn’t feel like a true victory. For me, the superiority of computers over humans in chess has a deflating effect that even makes it less fun to play against other humans. What’s the point of getting better at chess when the involved mental processes would be better delegated to a computer program, like long division or spell checking? Really Bad Chess alters the stale dynamic between people and chess AI through a novel handicapping mechanism. In the app, the AI never gets smarter. Instead, the variable is the relative strength of your starting pieces. This subtle change makes a transformative difference in the experience of playing chess against a computer. When you play your first game, your randomly generated starting pieces are way stronger than the AI’s, like this. Here, your job is to not blow your advantage, which itself provokes an interesting mindset. With each win against the computer, it’s starting pieces get stronger, until you’re staring at a disadvantage, like this. Having played a lot of chess against computers, my demise felt inevitable when I first played from behind against the AI. How could I beat the sharp precision of a computer program when it simply didn’t have to mess up to win? But then I realized that the AI in Really Bad Chess is prone to egregious blunders. Here we have the paradigm shift! Really Bad Chess jostled me out of the habit of comparing my intelligence to the machine. In this case, it’s no contest: I’m smarter than the machine. So instead of feeling like I need to match the calculating ability of a computer, Really Bad Chess motivates me to use my creativity to win as an underdog. The challenge is not to play perfect chess: it’s to exploit mistakes, like a hacker finding vulnerabilities in a system. But how much smarter than the machine am I? It’s unclear. Part of the beauty of Really Bad Chess is that there’s no clear wall. The more you win, the more severe your disadvantage becomes. But you could always discover new ways to leverage the AI’s weaknesses, making the impossible possible. Assuming the fallibility of one’s opponent leads to a growth mindset where there’s always hope of winning, regardless of the apparent odds. Winning as a big underdog requires breaking with the orthodoxy of “good chess.” When playing against a conventional opponent, human or machine, one avoids making moves that lead to a clear negative consequence. E.g., you don’t knowingly move a piece to a square where it can be captured, unless it’s an intentional sacrifice for a larger strategic gain. When facing a large disadvantage, however, your only shot at winning is when your opponent misses obvious opportunities. If you limit yourself to traditionally good moves, your range of options will be too limited to mount a comeback. In this sense, Really Bad Chess demands “bad” moves. There’s risk of getting punished, but this added freedom is what you need to tip the scale. I love Really Bad Chess because it cultivates a mindset of innovation. Breakthroughs happen when you recognize that the standard playbook for a situation is not optimal for the actual world we’re in. Really Bad Chess takes you through an evolution of shedding the conventional chess playbook to make large adaptions to a subtly different reality. Thanks to Tom Schmidt for sharing Really Bad Chess with me. Product managers don’t create things the way people often think of creating. We usually aren’t writing the code or crafting pixel-perfect designs. Instead, our role is to synthesize diverse inputs from customers and contributors into a singular direction; a narrative that guides the team who hands-on builds the product. On the surface, synthesis feels different from creation. Creation suggests introducing something new into the world while synthesis implies blending existing elements. However, Arthur Koestler explains in The Art of Creation that synthesis is not only a key part of the creative process but near to its essence. He uses the term “bisociation” to describe the fusion of two otherwise disparate matrices of thought. Koestler demonstrates that the greatest creative breakthroughs spanning science, art, and humor can be understood in terms of bisociation. Gutenberg’s invention of the printing press bisociated the techniques of the wine-press and the seal. Kepler’s laws of planetary motion bisociated the previously unconnected fields of astronomy and physics. In my post, When the Tension Snaps in Silicon Valley, I used Koestler’s concept of bisociation to explain the hilarity of HBO’s Silicon Valley show. In reading The Art of Creation, I’ve been struck by Koestler’s illustrations of the creative process, such as his representation of humor. A simple example is a pun, where a single word takes on simultaneous meaning in two associative contexts. One can imagine similar diagrams representing other forms of discovery. In the above illustration, M1 could be physics, M2 could be astronomy, and L could be Kepler’s law of planetary motion. Within each discourse, technique, or scientific paradigm, some patterns of behavior are intelligible while others are not. One can’t readily apply principles of military strategy when decorating a house for a party. Koestler uses chess as a metaphor to explain the dynamics of a thought matrix. Each matrix comes with a set of permissible moves, like the moves a rook or bishop can make on a chess board. Another way of representing the permissible moves in a domain could be a maze, like the one I’ve drawn below. The walls of the maze dictate where you can wander and where you can’t. The red path illustrates one possible train of thought through the matrix. Koestler’s visualizations of the creative process illustrate the fusing of two matrices of thought. Product managers, as I’ve explored starting with The Product Management Triangle, must synthesize input from three domains: business, users, and technology. Thus, I was inspired to visualize a model of trisociation, using mazes as metaphors for the constructs of each domain. I created three maze forms; one for business, one for users, and one for technology. Each form represents a distinct way of thinking. The business dimension of product development requires an understanding of economics and the motivations of investors. Building a product that users love requires a mastery of behavioral psychology and design. Engineering the product requires a grasp of physical possibility and deep knowledge of the chosen technology. Each one of these areas is independently deep, worthy of graduate-level study. Each one has its own language, history, and perceived dead-ends. Building a product requires trisociating a business model, market (user group), and technology. Unfortunately, it’s impossible to be certain that a certain blend will work together. The options are endless. It requires an abductive leap to choose the elements from each matrix for an attempted synthesis. The below illustration represents a possible area of focus within each domain; a business model, target market, and a technology. Let the attempted synthesis begin! As Marty Cagan says, the goal of product is to create something that’s “valuable, usable and feasible.” As entrepreneurs know, achieving just two of these conditions is hard. Attaining all three at once is magical. The below maze cube represents the success state — a connected loop touching all three matrices; tech, users, and business. Reaching the success state requires many things to go right. For one, you need to choose matrix regions that can be trisociated. Some attempted syntheses fail to generate durable progress, like the fusion of astronomy and religion. Let’s say we picked a different region from the users matrix. Maybe instead of focusing our app on the pet owners market, we focus on clowns. We could end up in a formation where it’s impossible to create a connected loop touching all facades of the trisociation cube. We’re blocked. You can think of a pivot as swapping in one matrix region for another. Flickr swapped in photo sharing in place of gaming. Groupon swapped in shopping for political movements. With many of the same pieces, they moved from blocked to trisociated. But even when you have compatible matrices fused together in your discovery process, it’s not guaranteed that you’ll find the path to synthesizing them. Freud took the right abductive leap to connect cocaine with medicine, but he missed the use case as a topical anesthetic. As Koestler conveys in The Art of Creation, the person who originally juxtaposes two matrices is not always the one who makes the breakthrough connection. Just as Karl Koller, not Freud, is credited with the discovery of cocaine as a local anesthetic, Darwin wasn’t first to bisociate biology and the struggle for existence. But Darwin was the one who most rigorously established the connection and demonstrated its validity. This last diagram shows a combination of matrices that can be connected with a loop, but the traveler is yet to discover the path. The explorer, with their own biases and tunnel vision, can’t know for sure that there is a solution. Tragically, they may give up, or pivot, before finding it. Use lean thinking to adapt your creations to the world as it is now. Use fat thinking to conceptualize how you will change the world or anticipate how the world will change. Lean thinking is how you win markets, tap into behavioral patterns, adapt to the economy, and create a killer app with graphs that go up and to the right. Fat thinking is how you create markets, change human behavior, transform the economy, and build a platform that births a multitude of killer apps.